Many of the VoiceLive 2's capabilities come to a smaller, cheaper device. Looping options are fantastic and flexible. Great fun and inspiring to use. Ergonomic, well-designed interface. Design can make connecting some cables tricky. You'll need to shell out for a pedal to get the full potential. 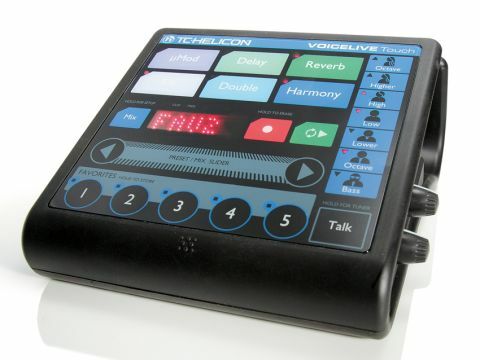 In the summer, we ran the rule over TC-Helicon's VoiceLive 2 and it was love at first sight. We were wowed by the combination of effects which could be applied on the fly, by the intelligent harmoniser and by the Looper which made building a performance around a single voice possible. So, it was with great anticipation that we unwrapped VoiceLive Touch, TC-Helicon's wedge-shaped, smaller processor which nevertheless permits many of the same tricks to be applied for substantially less money. The unit's wedge-shaped design is unusual. On a studio desk, it offers the upper surface of the square control panel at about 30 degrees, with effect and loop buttons (of which more shortly) large enough to avoid mistakes. Round the back, the patchbay waits, with XLR Mic In and Out connectors, main stereo outputs, Guitar In and Thru ports, MIDI In (for controlling harmonies via a MIDI keyboard), a USB 2.0 connector and a port for the optional footswitch - which brings more of VoiceLive 2's capability to this unit if you're prepared to shell out more money. This patchbay is housed within a moulded plastic design which swoops up behind the main body of the unit to provide a means by which VoiceLive Touch can be mounted to a microphone stand for live use. This is a neat design in the main, though it does occasionally lead to frustration as cables with long moulded housings will struggle to fit into some ports. However, once connections are made, the fun lying in wait is multi-layered. Effects-wise, VoiceLive Touch offers TC-Helicon's own CustomMod, as well as Delay, Reverb, Harmony, Doubler, Transducer, Tone, HardTune and Correction, Guitar FX & Tuner and VLoop module, where real-time looping can be recorded and instantly played back. Navigation is easy - there's a Preset/Mix Slider which, in default mode allows you to slide, ribbon-controller style, from one preset to another, with the removal of your finger triggering an almost-instant load process. If you can't remember the preset numbers of your favourite patches, worry not, as your top 25 can be saved into custom locations for more immediate recall. The active effects in any preset are indicated via an LED in the upper section, though pressing any 'unused' modules immediately brings those to the party too. Down the right-hand side, eight additional buttons allow you to work the Harmonic potential of 'Touch', with buttons labelled 'Octave Up', 'Low', 'Lower' and 'Bass' (as examples) offering their suggested harmonies with one touch. The display is clear enough for studio use but a subtle backlighting option would no doubt be welcome for live users. Perhaps the most fun is to be had with VoiceLive's Looping potential, whereby a prominent Record button allows you to capture phrases on the fly, while the green Playback button triggers those phrases as you stack them up. The numbered buttons below allow you to treat recorded phrases as separate 'tracks', so you can arrange on the fly, jumping between playback of all phrases at once to individual constituent parts. We're big fans of any technology which encourages creativity and it's bursting from this box. VoiceLive Touch isn't cheap but it's a great-sounding, intuitive tool.